Osprey Shores is a motorcycle friendly resort on Nova Scotia’s Eastern Shore. Our motel-style lodge is perfect for touring motorcycle travellers as you can park your motorcycle directly in front of your guest room. Convenient motorcycle parking directly in front of your guest accommodations. A dedicated wash area to clean your motorcycle. A 10% discount on green fees and club and cart rentals and priority tee-times. Full use of the resort’s recreational facilities including outdoor swimming pool, volleyball, bicycles, croquet, horseshoes, badminton, Mussel Cove picnic area and bonfire pit overlooking the Cove. 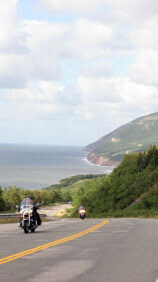 Complimentary copy of the Nova Scotia Motorcycle Touring Guide. We look forward to welcoming you and your friends at Osprey Shores on beautiful Chedabucto Bay as you tour Nova Scotia by motorcycle.